Humans and chimpanzees recently evolved a more active fight-or-flight response compared to other primates, possibly in response to the threat of warfare. Jung Kyoon Choi of KAIST in Korea, in collaboration with Soojin Yi of Georgia Tech, report these findings in a new study published April 19th, 2018 in PLOS Genetics. Humans and chimpanzees are the only primates known to frequently engage in warfare. If this type of aggressive behavior was common during their evolution, then the fight-or-flight response likely played a critical role in adapting to the threat of deadly conflicts. To find evidence of this adaptation, researchers looked for changes in the regulation of a gene called ADRA2C that can tamp down the sympathetic nervous system, which regulates the fight-or-flight-response. They analyzed genomes, transcriptomes, which are the entire set of genes expressed in a cell, and epigenomes, which are composed of the array of compounds that can bind to DNA and affect how genes are expressed, from numerous humans, chimpanzees and other primates. The researchers discovered that humans and chimpanzees acquired genetic and accompanying epigenetic changes that decrease ADRA2C expression, thus increasing signaling for the fight-or-flight response. These changes are missing in macaques and are not universal in bonobos, suggesting that the genetic variations spread in the population recently potentially in response to threats of war. 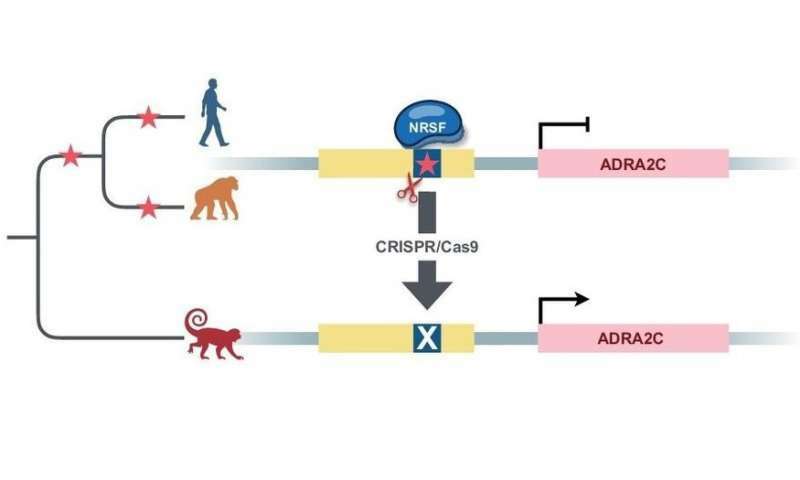 Jung Kyoon and his colleagues also used the genome-editing technique, CRISPR/Cas9, to demonstrate that reverting to the genetic states of macaques and bonobos can restore ADRA2C expression. Variations in ADRA2C gene expression can have powerful effects on behavior. Knocking out ADRA2C in mice significantly affects the fight-or-flight response and changes in the gene that occurred during chicken domestication likely resulted in less aggressive birds. The signatures of adaptations associated with reduced ADRA2C gene expression in chimpanzees and humans, which are missing from their more peaceful primate relatives, suggest that inter-group aggression may have shaped their evolution and could explain the evolutionary roots of human warfare.